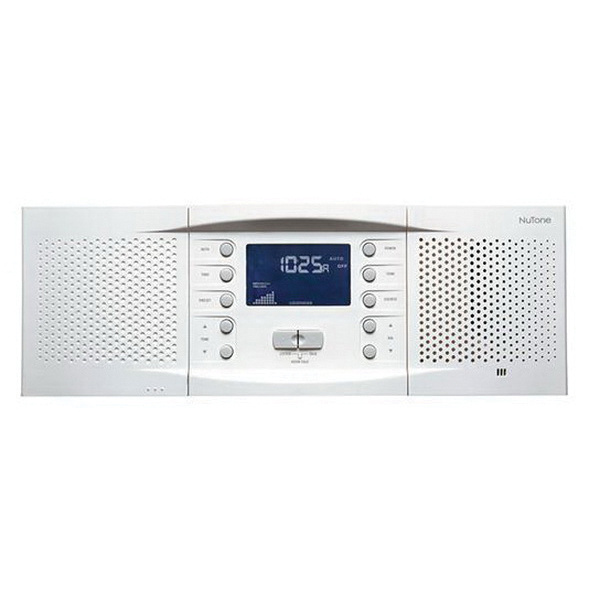 Nutone Intercom master station in white, supports up to 15 remote stations and up to three door speakers. It features two music source inputs and provides an RMS maximum output power of 30-Watts. The remote volume and source is controlled by remote stations. It has built-in AM/FM radio tuner to provide a setting for eight AM/FM station presets. Backlit liquid crystal displays operation mode, audio source, radio frequency, volume setting, time, disc number selected and track number currently playing. It has retrofit installations to ensure new installations. The master station with automatic ON/OFF, has programmable monitor override. The Category 5 wiring makes it suitable for indoor and outdoor remote stations.